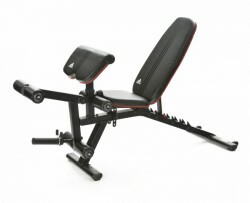 Upgrade your variety of exercises with the weight bench comfortably and effectively - up to a whole body training. The back rest is easy and quickly adjusted in different positions. Additional leg and arm upholsteries allow an isolated training of leg curl, leg extension, and biceps. The weight bench can be optionally upgraded with weight plates for more resistance. Be convinced by the classic Adidas design and the durable materials. The space-efficient weight bench fulfills all expectations regarding functionality, stability, and style.